This year I had the opportunity to blog with my accelerated Year 8 students. I started the blog with them last year and decided that I wanted to make it a regular part of our class. 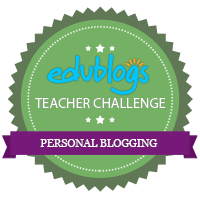 We used the Global2 platform (hosted by Edublogs) as it is a DET approved blogging site. With the help of tutorials from Edublogs, I started incorporating blogging into our English classes. It was a trial to see how it would work in high school as well as teaching them how to be responsible digital citizens. With the help of a google form students submitted topics that we would use throughout the year. They chose the word length and style and all got credit for their topics. Every Friday, students would complete 1 piece of writing that would have to be submitted for review. My students were already creating content and publishing it online, so I wanted to teach them to be responsible Digital Citizens. Students learnt how to use Creative Commons and where to find them. My teaching team and I spent a few lessons teaching them about Creative Commons and showed them how to find images that they could re-use without breaching copyright. Every term, we would revise the concepts and reiterate the importance of Creative Commons. I also included a page on the blog about Creative Commons licences, so that they could read through the information. If students submitted work that included an image that didn’t have a CC licence, they were asked to remove it and find a new image before it could be published. However I realised at the end of the year, that many still struggled with the concept and that I would need to continue to reinforce it next year. Most students simply accessed Compfight widget (through Global2) or PhotosforClass (widget on the class blog) to find images for their posts, as those were the sites we used most frequently in class. What are Creative Commons and where can you find them? By providing students with an audience apart from their teachers, it made them more accountable for their learning. It also helped students learn from their peers – by reading their friends’ work, they could see how others had interpreted the topic.The creative topics allowed them more freedom in expressing themselves – they could interpret the topic in anyway. It made them think about what they wrote- many students started to regularly check their work for errors and see how they could improve their writing skills. Students were taught to not only reflect on their learning, but to also provide each other with feedback. Since they regularly interact online through social media, it was important to teach them how to respond to the comments of others. By providing their peers with feedback, it gave them an opportunity to remember what they had learnt at school – it helped consolidate their own learning. It also provided them with a chance to respond to their peers’ comments in a positive manner. This was a tough skill to teach and not all students were able to put this into practice. Since I was determined to use a class blog, I needed to be flexible with the process of implementation as it was the first time that it was being used in my English class on a regular basis. I needed to support my team members during the implementation as well as providing ongoing support throughout the year. They were not familiar with Global2 blogs and needed to know how to use the blog features in order to help our students who would often lose passwords, have difficulties with posting or forget to keep up with the work. Our teaching team had to work individually with students to help them stay focused. Whilst students were working during class, on other units of work, we would speak to students individually and provide them with 1:1 feedback and help on their Blog posts. This practice was set up with the help of another teacher and implemented by the entire team, as it allowed us to cater for each individual student. Throughout the year, as my team members became more confident using the Global2 blog, they helped me review the Blogging unit on a regular basis, identifying issues as well as supporting the implementation process. At times, it was difficult to allocate a lesson to writing, due to other interruptions to classes. This would have an impact on the students, as many would forget to complete the weekly task. By providing them with 1:1 support, it allowed us to identify students who would struggle to write independently. The best part of this unit was discovering budding poets, philosophical writers, researchers, graphic artists as well as those who held a power to draw you into the world they had created with their words. By allowing students to interpret the creative topics in their own way, they were able to let their imagination run wild. Often they struggled with the word limits given or with certain topics, especially those who enjoyed writing, because they had to limit what they wrote. In the feedback they provided, they wished they had some weeks where they could choose their own topics. I can certainly see that I could have given them that opportunity especially in Terms 3 and 4, once they had become confident with using the class blog. Many students have now started using Wattpad, to share their stories with others on a more global basis. As a teacher, I will not have to wait to see them publish their writing in the future- they are already sharing their stories for others to read. What can your teachers do to help you with developing your writing skills?